If you are looking forward to buying school lab coat for your children today, you can always trust our wide collection of coats. We ship branded products only to suit the best safety measures for your child. A lab coat is considered as an importan... Read More.. If you are looking forward to buying school lab coat for your children today, you can always trust our wide collection of coats. We ship branded products only to suit the best safety measures for your child. A lab coat is considered as an important element of school uniform. Safeguard: Lab coats safeguard you from any accidental spills. They also prevent your skin to in contact with any hazardous chemical or substance. Fire Resistance: Our lab coats are made up of fire resistant material, thus protecting students from any fire disaster. The coat is actually made up of polycotton, which is a mix of cotton and polyester. Cloth protection: A lab coat is also important as it saves your original clothes from any splash, mark, dust, and contamination. The coats are only meant for students of 9th to 12th grade. This covers age group of sixteen to eighteen years. The coat is available in all the sizes, that is, small to extra large. It is also available for both boys and girls. The only color for lab coat is white. 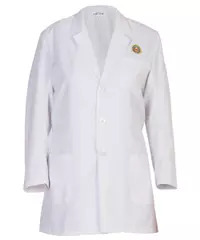 White coat constitutes the professional attire for students working in labs. Our lab coats are shipped from the Topper uniforms brand. Our school partner for lab coats is Amity international school. Yet many schools are about to join us for coat sale. Easy exchange policy is our strength. We exchange goods in case of damage or tampering. The exchange is only available when filed within seven days of receiving the order. We only deal in popular school brands. These brands ensure the maintenance of quality with quantity. You can also order school lab coat online in bulk. The wide range of payment options available with us makes the customer’s purchase easier. There are additional charges applicable on shipping and cash on delivery. We have 24x7-customer service available. Contact us via support@myschooldepot.com or +91-81266-26666 for queries and partnership. So, if you want the kids to remain protected while experimenting in the laboratory, get the lab coats ordered with us. You can order your lab coats at My School Depot! For any confusion and any sort of query, contact us! Read Less..